Hello! I hope you are having a wonderful holiday weekend so far. I know we are... and today I'm so thankful for all those who have served for our freedom and my heart goes out to any that have lost a loved one. Jillian has become so familiar with the herbs I can actually be cooking in the kitchen and ask her to run out to the garden for something specific. She loves that. Rising bread never fails to make me happy. It took me an embarrassing long time to conquer homemade bread... I had many failures before a success. I think it is truly a labor of love... it's more than just following a recipe... so much of it is learning the way it should feel and look. This bread was absolutely wonderful and so flavorful. There just wasn't any way I could wait until the evening meal before sampling it. Do you enjoy making bread? Try it some day... it's worth the effort, I promise! Every now and then Jillian and I have a tea party. We get out my nice dishes, set the table and I try to fix some special little treat. It was the perfect day to set aside a little downtime since our next week and a half is going to be busy, busy. We had fun setting the table outside on the front porch, since the weather is so beautiful right now. In the past we've always had hot tea, but we fixed a raspberry mint iced tea today. (Sweet, of course!) It was so refreshing. I made a couple loaves of french bread this morning, one for meals this week and another for the freezer. I love making bread, but don't have (or don't make) the time to do it as often as I would like. It had been a while, so we scarfed half of a loaf, just the two of us! The hydrangea bush is in full bloom now. You can find the french bread recipe here. This was a new recipe I tried and it was easy and delicious. Jillian patiently waited for me to take some photos by putting butter on her bread. I think the butter probably could have entertained her for an hour. Meanwhile, Rosetta was also there... on the opposite side of the porch playing in potting soil. (Boy, she can move fast!) Unfortunately, I didn't get a picture of her... I was too busy running her to the sink. The tea was something I threw together... I tossed in a handful of raspberries, a few sprigs of mint and some sugar with the hot tea to steep, strained after half an hour and then added cold water. As it turns out, I was the one that really needed this time. It's funny how a little time away from the things that trouble you can put everything back into perspective. I hope you are all having a wonderful May! Today it seems like there are many things I could write about, but I find what I really want to share with you is our garden. I had no idea how rewarding it would be to look out my kitchen window every morning to watch it grow. Or how forward I would look to my weekly weed pulling. How much I would enjoy simply walking around and examining new signs of growth. I am so anxious for fresh veggies from our garden. It's become so important to me to know what is in our food. And it's important for us to teach our girls what our land can provide us with. It's astonishing to me how it went from a plot of dirt with some pine straw thrown in for good measure to this. Our zucchini plant is so big it's almost scary. Will it really get bigger?! And it looks like squash will be on the menu this week. My favorite! Hope your week ahead is wonderful! My brother and sister-in-law live nearby in an old farmhouse and this week I finally made it over to their place to see their completed upstairs room renovation. It is an absolutely stunning transformation and I had to share it with you. 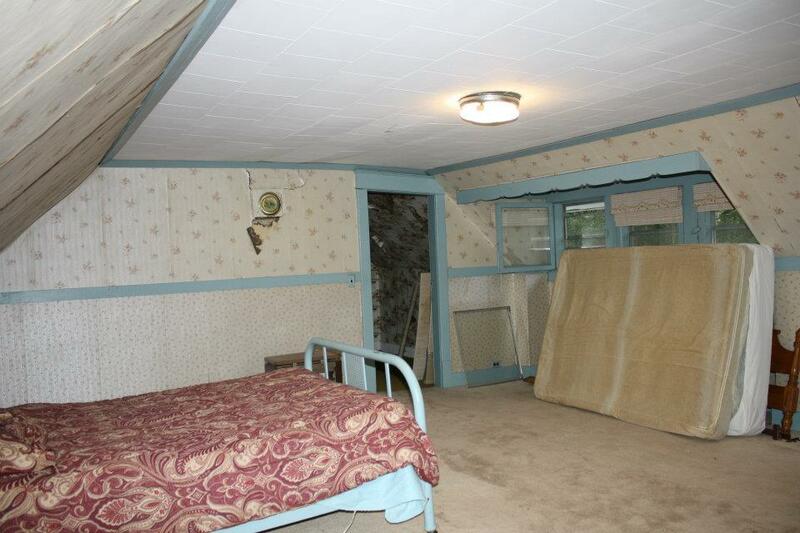 When they first bought their place, the upstairs was extremely outdated and what my sister-in-law and I referred to as a little "creepy". They stripped wallpaper, pulled off ceiling tiles, carpet, hundreds of nails and painted, painted, painted. It's just another example to me of how transforming hard work and paint can be. This room is now light, cheerful and beautiful. I love that the original planks were painted white and the painted blue floor perfectly finishes this restful room. And a parting shot for you... my favorite thing about their 8 acres is the original stone fence on the property. I snapped a picture of it while I was there... this photo is a little bright, but do you see it? Every time I look at it I'm amazed that it is still standing after so many years. 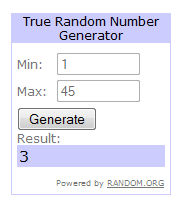 And finally, the winner of the Ramsign giveaway is comment #3. Congratulations, Gretchen! I'll be putting you into contact with Ramsign so they can send you one of their beautiful enamel signs. We've done some work in our front yard this spring, including moving our driveway, removing our front shrub bed, and painting a little of the porch. Our plan is low-maintenance, so my handy husband built four flower planters for our front porch. Other than a few hydrangea shrubs and the flowers in the planters, everything else will (eventually) be grass in the front yard. I finally finished painting the planters and we went out and bought soil and annuals. I think they turned out to be such a pretty addition to our porch and I can't wait for the flowers to grow and fill in. We have some sod to lay in the front and a tiny bit more painting and then I think we are done with our outdoor improvements (for this year anyway)! After the rain it seemed like everything in the garden grew at least a few inches and our hydrangea bush by the front porch is decked out in blooms. I just love the variety in color. It's so challenging to get a picture where both girls are smiling! Such a nice relaxing weekend... maybe a little too relaxing since all I accomplished on my to-do list was planting some flowers! 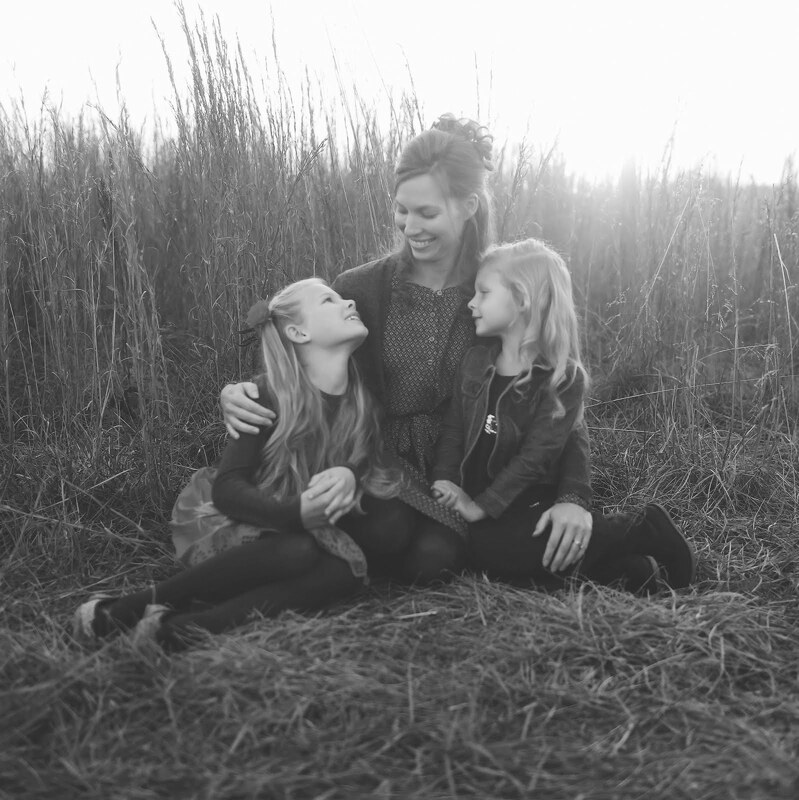 I am so thankful for my little family and feel so blessed to be the mother of two beautiful, sweet, healthy girls. I always knew I wanted to have children, but could never have imagined how much joy they would bring! Did you do anything special for Mother's Day or did you just enjoy time with your family? I have a delicious summer salad recipe to share with you today. I made this for my daughter's recent birthday party and it was fabulous. The majority of the salad can be made beforehand. You simply mix in the lettuce once you are ready to serve. Talk about a perfect make-ahead recipe! The recipe called for chilling for 2 hours, but I tossed together the ingredients with lettuce the following day and it still tasted just as fabulous. Combine first 7 ingredients in a large bowl; cover and chill at least 2 hours. Toss with lettuce just before serving. Whisk together 1/4 cup rice vinegar; 2 Tbsp. sugar; 3 Tbsp. fresh lime juice; 1 garlic clove, minced; 1/2 tsp. salt and 1/2 tsp. freshly ground pepper. Gradually whisk in 1/2 cup oil until smooth. Good morning! I hope you are all having a wonderful week. Recently a company named Ramsign contacted me and asked if I would be interested in giving away a house number sign on my blog. I had seen their unique enamel signs before but when I clicked over to their website I was blown away and happily agreed... I would love it if a Keeping it Cozy reader owned one of these signs! I adore signs and what appeals to me most about Ramsign is that they specialize in manufacturing genuine hand-crafted signs that look old fashioned. They are a thick and glossy enamel and are hand stenciled. They would look great displayed outside or inside. But this giveaway is for you, not for me! So here are just a few more examples of some of the designs you can choose from. The winner can choose from any house number sign with 1-5 digits of any size and design (worth up to $99!). Delivery is free of charge of course and your sign can be shipped world wide. 1. Simply leave me a comment (be sure to include your email address so I have a way to contact you). 2. For an additional entry, you can visit Ramsign's website or Facebook page (where they have a beautiful photo gallery) and then leave me an additional comment with the design you would choose should you win. Thanks for entering and thank you Ramsign for donating one of your beautiful signs! This week while my daughter was at her gymnastics class I made a quick run into a shop. I immediately spotted this pitcher. It had a price tag of $15.95. When I turned it over I knew I had found true ironstone. I did a quick internet search that evening and realized my ironstone pitcher was a true treasure, dating back to c. 1890. It has a couple chips and some crazing, but that doesn't bother me... it just adds to its character and history. So far the lavender in the garden is doing well and I clipped some for the dining room. Right now my pitcher sits here but I'm sure I'll eventually find a more permanent home for my new find. What do you think... did I find a treasure? Do you ever feel the urge to change your furniture around as the seasons change? It all started when I ran into our local fabric store for some trim and spotted this cheery red fabric. Hm, this would make great summery pillows. Then with the plan of sewing pillow covers that evening, I decided to thoroughly clean the living room, which then resulted in wondering if my favorite cupboard that was just hiding in our bedroom would look pretty in a corner of the living room. Which then led to an entire furniture rearrangement. In the midst of a busy morning working, running after two girls, renovating our upstairs, and just the busyness of daily life, it felt so nice giving our living room a fresh and cheerful update. Just right for the beginning of May and the promise of warm, sunny days ahead.